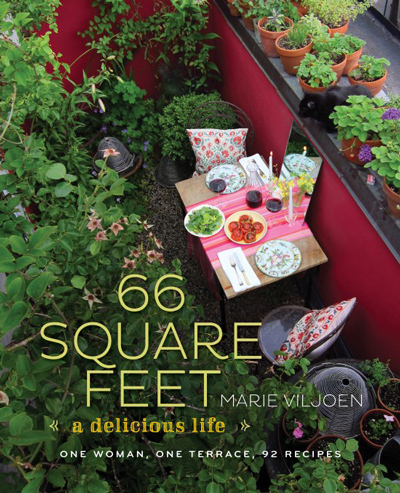 In our 9th issue Marie Viljoen describes New York in September, an excerpt from her recent book 66 Square Feet – A Delicious Life, a book inspired by her garden terrace, foraging exploits, botanical excursions and living attune to the seasons – all in the “most famous city on the planet”. In honor of proper picnics and plant-inspired travels across city limits, we are giving away a copy of her book. For a chance to win tell us your city getaway, the unlikely green space at a street corner, the bit of wild space on the edge of town, your preferred picnic destination or urban park. Post your answers in the comments below and we will choose a winner at random in a week’s time. This entry was posted in Issues on September 16, 2013 by Barbara. I have a dog so I know a few secret places. I like to access the Humber by parking at Lambton Arena, up Howland Avenue off Dundas St. just past the Scarlett Road turnoff. I take my dog and sometimes my fiddle. I heard there’s a piper who also plays there. To get there, you walk past the playground and into a stand of towering pine trees. To get into the humber river valley, keep going until you get to a very steep sandy path that takes you straight to the bike bridge. I love the woods just across the bridge, especially in winter after a new deep snow fall. Its magical. But there’s another secret about this spot. Before you go down into the Humber river, in the fall, there are some native plants with the most interesting berries. I don’t know what they are, I have never seen them anywhere else but they are really colourful and very special. Another little secret about this area is that under the power lines which run along side the rail lines, there’s a little maze of paths that probably get used by trick bikers. Back in there, there is a little fire pit for a secret little campfire in the city. If you don’t want to take the steep path down into the river, there is also a path on the left/south side of the playground which is tricky to find, both going down and going up. My favourite city getaway spot is my own backyard in Riverdale. My little eden is green, shady and (mostly) quiet. The birds and squirrels are an endless source of entertainment. I love to entertain friends on the deck and share the peace and nature that I’m so fortunate to have, literally, right in my backyard. I highly recommend Withrow Park in Riverdale/Danforth. It has beautiful, very old trees and is much less crowded than some of the other city parks. You won’t hear much traffic noise either. On a sunny Saturday afternoon, take a blanket and a book with you, check out the farmers market, and pick one of the trees. My favorite tree is the one in the south-east part, just at the bottom of the stairs leading up to the soccer field. If you have a dog, the dog park just north of the baseball field is a great place to hang out with fellow dog lovers. The city has just cleaned it up. From the walkway besides the soccer field, you can even see the downtown skyline. I enjoy walking or biking at this man-made headland. Either on a sunny afternoon on a weekend, or any day I need to find serenity to calm myself and get close to nature. Sometimes I also like the sound of birds chipping and waves splashing onshore. My favorite spot is the lighthouse. It´s a romantic little platform where you can share an intimate moment with someone special while admiring the skyline of Toronto across Lake Ontario.